A huge thanks to my lovely contributors to my first Blogathon and of course to the talent of the Dallas cast without which this Blogathon would not have been possible. Just before the Darlin’ Dallasers Blogathon started, wa lovely retweet and a like – see above – from Morgan Brittany who played Katherine Wentworth in the show and Linda Gray who played Sue Ellen. Thanks Linda and Morgan. 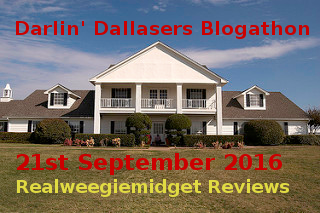 Then from the 21st September – on what would have been actor Larry Hagman’s 85th birthday I held my first Realweegiemidget Reviews Blogathon for 3 days. 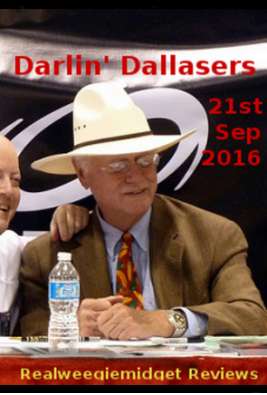 It was named the Darlin’ Dallasers blogathon in relation to Larry’s iconic role as J.R. Ewing, the infamous oil baron of the soap opera, Dallas (1978-91). With the support of many lovely writers who sent me your wonderful reviews, all went well. Thanks for joining in the celebration of this actor’s life and I thank you all for your contributions. I’ve learnt so much more about the movies and television, Larry and this terrific cast worked on before, after, and during their time on Dallas (1878-91). Thanks also for researching the actresses or actor’s roles in Dallas and for sharing this with non-Dallas aficionados. Despite few of you admitting you’d never seen it your life! Thanks to you the Dallas tag in this page is looking bigger and brighter than ever. The original schedule is HERE, if you are on this and still want to contribute add your link in the comments to this page, and I’ll add an update soon. Contributions on George Kennedy, Patrick Duffy, Barbara Bel Geddes and Howard Keel. Not forgetting the birthday boy himself, Larry Hagman. Contributions on George Kennedy, Linda Gray, Barbara Bel Geddes and Lesley Anne Down. Contributions on George Kennedy, Patrick Duffy, John Beck, Barbara Bel Geddes, Lou Diamond Philips, Priscilla Presley and Larry Hagman. 16. LifevsFilm tells us about George Kennedy (Carter McKay) and Priscilla Presley (Jenna Wade) in Naked Gun (1988). Also a final mention to all you reviewers, that I received this from the Lovely Linda Gray who played Sue Ellen, on my Facebook page, the morning after the Blogathon ended which I’d like to share with you all, Thanks, you really made my day just with that lovely gesture.